Friday has descended and weekend is near! I feel lighthearted, my nagging cough mysteriously disappeared after my event(! ), and I have a wonderfully bustling weekend all planned out. It feels really great! Even the thought of ploughing through my many "clumps" of dirty laundry (as Roboman puts it), inspires in me a sense of purpose. AND randomly, isn't this pair of baby socks so adorable? 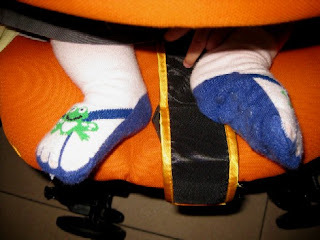 I was so tickled when I saw them on my favourite baby. They even have little non-slip rubber bits on the soles! very cute :) kate also was wearing one when i saw her, but in mary janes style!